In the January 2016 document, "IU Online: A Collaborative Model for Online Education at Indiana University," Executive Vice President for University Academic Affairs John S. Applegate provided a brief description of Indiana University’s collaborative approach to online education. urgency for IU Online Class Connect, "the backbone of collaborative degrees." Online education is still "growing strong" at Indiana University according to the spring 2016 census reports. The university now offers 104 academic certificates and degrees online. More than one-quarter of IU's students (26.5 percent) are taking at least one distance education class. These enrollments account for 10.3 percent of the total IU credit hours taken. The 7,446 students with 100 percent distance education schedules account for nearly 8 percent of all enrolled IU students. 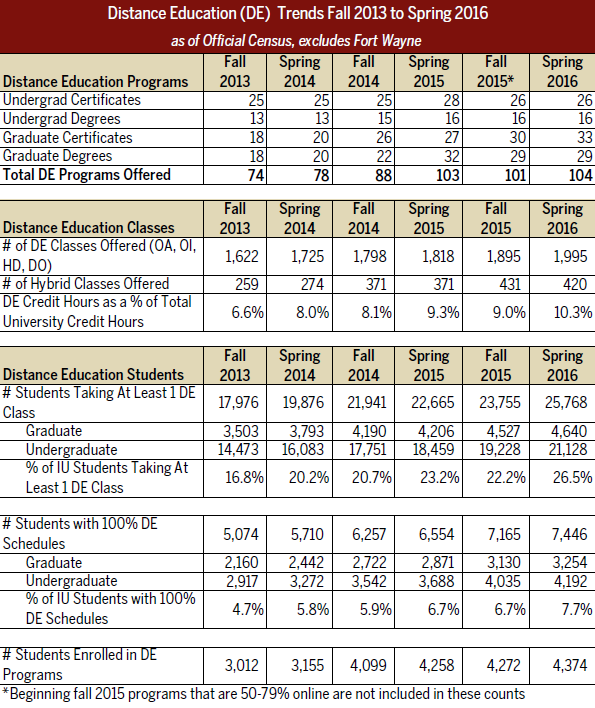 The table below shows IU distance education trends from fall 2013 to spring 2016. More data regarding online education at IU is available in the CBI. Make sure you log in, and expand the Student and Online Education folders. Questions about the data? Please contact OOE Data Manager Sharon Wavle (swavle@iu.edu). Staff changes are enhancing the Office of Online Education's (OOE's) ability to collaborate with campuses on the development of joint online degree programs and to market the IU Online brand. Sharon Calhoon has been named director of collaborative academic programs in the IU Office of the Executive Vice President for University Academic Affairs (OEVPUAA), the administrative home for the Office of Online Education. In her existing role as an OEVPUAA assistant vice president, Sharon has played a major role in the development of multicampus degree programs. Her additional title highlights academic online program development as one of the key functions for the Office of Online Education, along with compliance, seamless student services, and marketing and recruitment. This past October, David Halloran joined OEVPUAA as a program manager with a focus on curriculum development. David holds a PhD in English literature from UCLA. He came to OEVPUAA from the College of Arts and Sciences at IU Bloomington. Over 11 years working as an assistant dean, David forged a deep understanding of IU’s academic structures, as well as the procedures and policies governing curricular development, review, and approval. In the past three years, David coordinated curricular development for the College’s three new schools: the School of Global and International Studies, The Media School, and the School of Art and Design. David appreciates the opportunity to work with his OOE colleagues to foster the growth and development of IU’s online programs. Sarah Storm joined the Office of Online Education in January 2016 in the newly created position of digital media/CRM (customer relationship management) specialist. In this position, she will help market the IU Online brand and recruit students. A graduate of the University of Maryland, Sarah brings to the position a broad background in marketing, design, and development. Most recently, she served as digital media specialist at the Indianapolis headquarters of the National Association of Mutual Insurance Companies (NAMIC), where she was responsible for the creation and distribution of all electronic communications and for executing and evaluating digital marketing campaigns for the association's in-person and virtual education events. Prior to her employment at NAMIC, Sarah worked as an account manager at Hanapin Marketing, a pay-per-click Internet marketing and advertising agency and as the junior interactive art director at Finelight, a marketing and advertising firm representing multiple sectors. Sarah's duties in the Office of Online Education include digital marketing and analysis; social media planning and implementation; creation and implementation of strategies for keeping the IU Online website visible to search engines, fresh and competitive, and relevant to OOE's overall marketing efforts and brand; assistance with the implementation and management of Salesforce, OOE's customer relationship management system; and the strategic use of Salesforce to reach out to prospects, students, and alumni. Online degree programs at Indiana University again were ranked among the best in the nation in the 2016 edition of U.S. News & World Report’s Best Online Education Program rankings. IU Online made one of the biggest jumps in U.S. News’ rankings of more than 300 online bachelor’s programs, moving more than 30 spots, from 72nd in 2015 to 39th this year. Two programs at IU’s Kelley School of Business ranked at the top of more than 200 graduate business offerings nationwide. The Kelley Direct online MBA program was one point away from a top score of 100 and was ranked No. 2, and Kelley’s Master of Science program ranks No. 1 and had a score of 100. The publication also issued rankings for graduate online programs in engineering, education, nursing, criminal justice, and computer information technology. The IU School of Education was ranked 22nd, and the IU School of Nursing at Indiana University-Purdue University Indianapolis moved up six positions to 42nd. The Office of the Executive Vice President for University Academic Affairs (OEVPUAA) is looking for an assistant director of online academic program development. This is a two-year, 12-month appointment (full time) for a tenured faculty member from any of the seven IU-administered campuses. The assistant director will work with Assistant Vice President Sharon Calhoon, Senior Advisor Bill McKinney, and Associate Vice President Michael Rushton to facilitate the development of collaborative online academic programs. Ideal candidates will be experienced faculty members who have an interest in, or experience with, online education. In addition, candidates must have excellent writing and oral communication skills; group facilitation skills; an understanding of, and support for, shared governance; and experience in curriculum development (including development of student learning outcomes). Administrative experience, service on university-wide committees, and familiarity with IU’s academic program approval process are preferred. View the complete position description and instructions for submitting applications here. Please submit your application by February 15, 2016.